Moving can be one of the most stressful experiences you go through. Unfortunately, professional moving companies don’t do much to make that experience any easier. Paying a fortune to have a team of people you don’t know race through your home to pack up your possessions before dumping them on a truck is almost always a recipe for disaster. Lucky for you, there’s another solution — Zippy Shell. 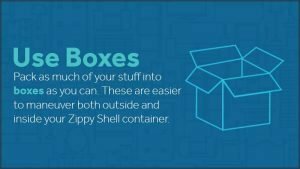 With Zippy Shell, a professional driver drops off a portable storage unit at your home or apartment building. These shells are designed to fit into a standard parking space, ensuring that your neighbors won’t get upset while you’re busy packing. Since you’re on your own when you load your Zippy Shell, it’s a good idea to have a plan for how you’re going to load it. Simply throwing your stuff in will lead to a lot of wasted space and maybe even some broken items. Instead, follow these rules to pack your Zippy Shell efficiently. Get these packing essentials: Having the right tools on hand makes a world of difference when packing. For this job, you’ll want to have a dolly, loading straps, paper pads, furniture pads and some stretch wrap. Prep your items: Using the tools listed above, start to prep your items. Use the stretch wrap to protect upholstered furniture, and use the paper and furniture pads to wrap other furniture items you think could get scratched during the move. For added protection, place everything on top of a furniture pad in the container. Use boxes: Pack as much of your stuff into boxes as you can. These are easier to maneuver both outside and inside your Zippy Shell container. Don’t forget to label your boxes, and tape them closed. 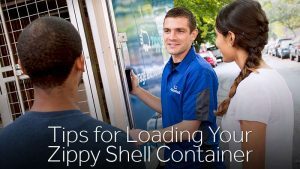 Prepare for loading your Shell: Stage as many of your household goods as close as possible to where your Shell will be loaded, e.g. the garage. Arrange all like-size boxes/tubs together, keeping fragile pieces to one side. Carefully wrap glass and wall hangings. Distribute the weight: Most people will tell you to place your heaviest items at the back of the container, but really you’re better off finding a way to distribute the weight evenly throughout the shell. It’s OK to load these items first, just make sure you disperse them. Remember, you have the entire shell to use, so you can stack items from the floor all the way to the ceiling. You should always load light-weight or fragile items at the top, ensuring that they don’t get crushed. Fill those tight spaces: Starting with a sturdy piece of furniture as a base, pack boxes and tubs on top of the furniture after appropriately wrapping the furniture. Try to arrange boxes and tubs in such a manner that the thickness of your “tier/wall” is the same as the depth of the furniture piece, so the tier/wall is close to straight up and down, left to right. You can make sure you’re using the space effectively by mixing small items with larger ones, filling all open gaps in your tier/wall, attempting to pack everything as snuggly as possible. It’s good to intermingle boxes and tubs with your furniture, as they protect the furniture by reducing shifting and furniture-on-furniture rubbing. Flat screen TV’s, glass, mirrors and pictures are best stored vertically, sandwiched between your mattress and box springs. Tie it down: Once you’ve finished packing, tie down your belongings as best as you can. It’s good to “book end” your neat,squarely packed items using a mattress, box spring or tall bookcase that is securely tied to the container. Lastly, you want to load those items that are not square or don’t stack well, wrapping appropriately, and securing each to ensure no shifting. These kinds of items include things like bicycles, patio chairs, ladders, BBQ grills, etc. This month, Zippy Shell is offering 50 percent off content protection and $40 off storage rental when you mention this ad! Call today and get your Zippy Shell reserved.